Galaxy has been designed to enable application developers to build large-scale, distributed applications. Galaxy provides a very powerful set of distributed application development and runtime capabilities through its Distributed Application Services (DAS). DAS consists of libraries, runtime services, and tools that are used to build applications that export, locate, and use applications services distributed over the network. DAS provides a high-level API that enables developers to write applications that will communicate with any other Galaxy application running on any platform. 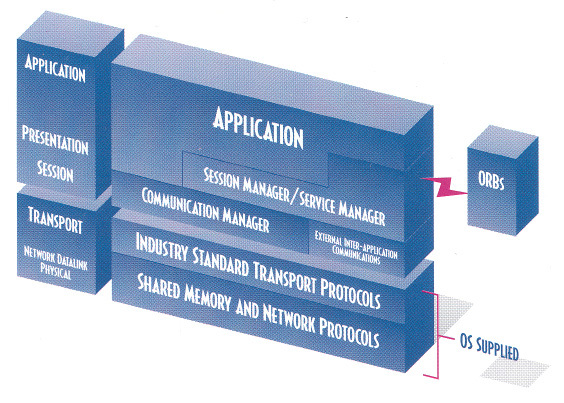 DAS uses an asynchronous, symmetrical, peer-to-peer communications protocol for efficient, high-performance message based interapplication communication. DAS can be used to implement distributed services in peer-to-peer, client/server, or even master/slave mode. DAS terminology uses “service provider” to refer to an application which is exporting a service and “service consumer” to refer to an application which is using a service. DAS dynamically locates and matches the attributes of services registered by service providers with the attributes of services requested by service consumers. Consistent with the overall design of Galaxy, the DAS architecture is built of multiple levels of abstraction, ensuring application portability and extensibility, and the extensibility of DAS. DAS has been designed for maximum developer productivity. Objects can be easily modified and enhanced, and entry points can be added to the API to meet specific project needs. This is consistent with the overall Galaxy abstraction model for containing the effort required to manage platform dependencies and functionality differences across platforms. Several DAS managers are derived from more general-purpose Galaxy managers. For example, the Datatag Manager is based on the Representation Manager. DAS consists of eight object-oriented components: six service managers, a standard dialog object called the Service Chooser, and a runtime service directory and registry called the Service Broker. A Service Broker is a DAS service that knows about other available DAS services, which register themselves through the Service Broker Manager. Service providers register themselves with the Service Broker and service consumers query the broker for appropriate providers of the service needed by the requesting application.